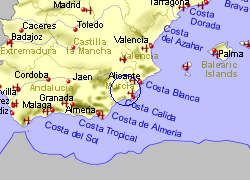 Located 40Km inland from the Costa Calida coastline, the large town of Alham de Murcia nestles agains the Sierra Espuna mountains, which rise to over 1400m, the highest point in Murcia province. The town itself lies only 180m above sea level, having effectively flat land all the way between it and the Mar Menor, and is overlooked by the ruins of a Moorish Castle, on a steep hill 100m above the town. This busy working town has good communications with A-7 Mediterranean Motorway nearby, and the RM-2 heading towards Cartagena. 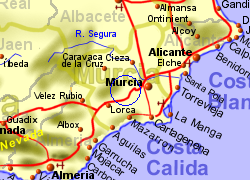 Alhama de Murcia also has the Lorca to Murcia Railway line running past it's southern ege. 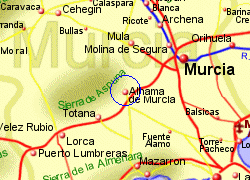 Map of the Alhama de Murcia area.